Making Bread by Machinery—Berdan&apos;s Patent Automatic Oven, &c.
It is somewhat remarkable that up to the present time, when almost every want of civilized man is supplied by machinery, the manufacture of bread—the first of all necessaries, the "staff of Jife"—should be almost universally carried on in as rude a manner as by the ancients. It is true that the primary process of converting the grain into flour may be said to have arrived at perfection, but beyond this, the manufacture, as generally practiced, differs little from what it was in the days of Moses. The subject has, however, within the last few years, attracted much attention from scientific and ingenious men, both in this country and in Europe, and it now seems that this most imports,nt of all the useful arts is to be no longer behind those which minister to our other wants. A mechanical bakery has just commenced operation in Philadelphia, the ovens and machinery of which are the invention of H. Ber-dan, of New York city, which is capable, when worked up to its full capacity, of converting into bread the enormous quantity of 1,000 barrels of flour daily, estimated sufficient to supply the entire popmation of the Quaker City. By the immense sav.ing of labor, fuel and space, the bread can be supplied from this establishment to the consumer, at a cost very greatly below that charged by bakers, and even cheaper than it can be made by families, purchasing their flour at retail. A brief description of this immense concern will, doubtless, be interesting to the majority of our readers, though it would require engravings to give anything like an adequate idea of it. The building is four stories high, to the uppermost of which the flour is conveyed in the barrels by a hoisting apparatus, and after being turned out of the barrels, is sifted by suitable machinery, and afterwards conveyed into a large hopper belonging to the kneading machine, which is on the floor below. This machine is composed of a horizontal cylinder, in which rotates a bar for stirring the flour, water and ferment together, a scraper forpre-venting the adhesion of the dough to the cylinder, and a "flopper," which cuts into and opens the dough, takes up several hundred pounds of it at a time, and throws it about in a most remarkable manner, somewhat imitating, on a large scale, the operation of kneading by hand, causing much air to enter into it and be retained within it distributed in small cellules, and making the bread very light, with a small quantity of yeast. From this machine the dough is conveyed to the hopper of the loaf-making machine, the principal portion of which is on the second floor. This machine cuts or molds the dough into loaves, and registers the number made. The molds or cutters of the last-mentioned machine are variable, to enable the loaves to be varied in size exactly in proportion to the market price of flour. The loaves, after being formed, are carried off by an endless apron to a convenient point, to be taken by attendants and placed on brick-bottomed cars, on which they are passed into the ovens and baked. The ovens, of which there are two, are upright, and occupy comparatively little hori- zontal area. They are independent of each other, and each complete in itself, containing a system of upright endless chains, which are constantly in motion, to convey the bread from one door of the oven on the second floor of the building, where the breadis introduced, down to a door on the first floor, where it is discharged when sufficiently baked ; the time occupied in its descent being just sufficient for the baking process, which is made continuous for any length of time, by the introduction of new supplies as fast as the discharges take place, the oven being thus kept constantly filled with the bread at progressive stages of the baking process. While the baking bread is passing down the oven on one side, the cars which have been emptied on the first floor and introduced at another door on the same floor, are passing up through the oven on the opposite side to a door on the second floor, where they are discharged, to be re-loaded and introduced at the first-named door again. There are four doors in all, two on the first, and two on the second floor. The endless chains of the ovens are made with rails, on which the cars run in and out. The doors are opened one at a time, at proper intervals, for the admission and exit of the cars, which are drawn into and expelled from the oven, and moved from the discharging to the receiving doors outside the oven all by machinery ; and the only manual labor in the whole establishment is that of loading and unloading the cars. The oven is built entirely of brick, and the cars on which the bread is baked are, with the exception of light iron frames, made entirely of brick. Of'the advantage of brick ovens it is needless to speak. The ovens are heated by fires which are tended in the basement of the building. This bakery, which is the property of joint-stock company, composed of some of the most influential men in Philadelphia, is one of the most perfect manufacturing establishments we have ever seen ; and its machinery works with the precision of a clock. We had the pleasure of witnessing its operation on the opening-day, which was celebrated -last week by a public djeuner within its walls, at which some of the most distinguished men of the city were present ; and in the speeches that were made on this occasion, Mr. Berdan received some very flattering compliments, to which he replied with great feeling and good taste. 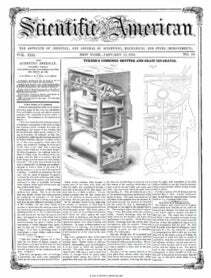 The oven and kneading machine have both been patented through the Scientific American Patent Agency is this country, nd' in almost every country where patents are granted. Bakeries on the same principle are now in course of construction in New York, Boston, Baltimore, New Orleans, and other large cities ; and it is hardly venturing too far to predict that similar concerns will be started, and come int.o successful operation, in every city of the Union, for cheap and pure bread is one of the greatest desiderata in large communities.